Last Friday’s shooting at the Noor and Linwood mosques,in New Zealand was the deadliest mass shooting in the nation’s modern history and has sent shock waves across the globe. The recent updates state that 50 people, hailing from Afghanistan, Egypt, Jordan, Bangladesh, India, Pakistan, Palestine, Kuwait, Saudi Arabia, Turkey, Indonesia, Malaysia and one New Zealand native Linda Armstrong were killed in Friday’s massacre conducted by 28-year-old Australian Brenton Tarrant. Moments before the armed Tarrant went on his killing spree, he played a traditonal marching song of the British military called “The British Grenadiers”, “Gas Gas Gas”, a song by Italian musician Manuel Karamori and “Serbia Strong”, a Serb nationalist song from the Bosnian War (1992–1995) celebrating Radovan Karadžić, who was found guilty of genocide against Bosnian Muslims. Though New Zealand’s authorities took time in releasing the names of attack victims, the foreign ministries and diplomats from around the world identified their nationals as the victims. I don’t completely agree with the arguments present here but I want my fellow citizens to hear the voice from across the border. The latest crises between India and Pakistan has seen an enormous amount of hate and war warmongering narratives especially coming from the other side that has crossed all lines of ethics and civility. Since last week, regional viewers and readers have been bombarded with non credible and fake news for promoting the propagation of negativity and war hysteria. We have observed strong anti Pakistani sentiment spurred by the Indian media reporting, this fact was also confirmed by the captured Indian pilot Wing Commander Abinandan that has been returned safely to his motherland, yesterday at the Wagah border. 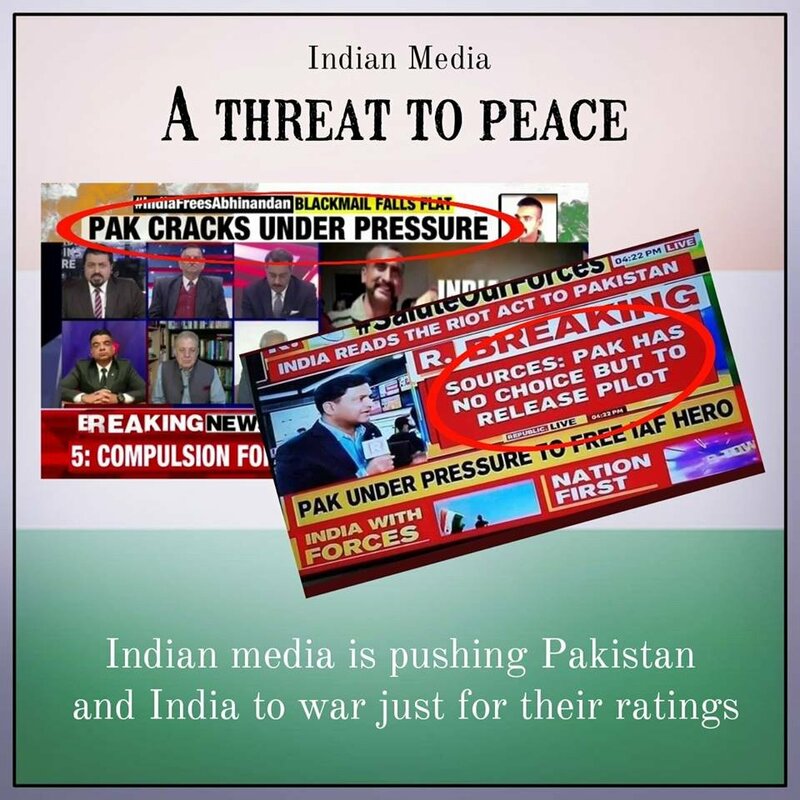 Before leaving for his country, the Indian pilot in his last video before release admitted that the Indian media exaggerates a lot when it comes to issues related to Pakistan. “They make a mountain out of a molehill,” he said in this new video that surfaced on social media on Friday afternoon. Have You Read The Story Of Nadia Murad?